It takes a certain kind of genius to turn attention away from the links between the Zionists and fascist/far-right parties and onto the Palestine solidarity movement. This is the solitary 'achievement' of the supporters of Gilad Atzmon, inside and outside Palestine Solidarity Campaign. It is to the eternal shame of Gill Kaffash, Roy Ratcliffe, Frances Clarke-Lowes et al. that they have managed to align themselves with those whose hatred of Jews is second only to that of Muslims. Of course there is no contradiction between supporting what the Nazis did to the Jews and what Israel does to the Palestinians. Were not Arabs lower on the Nazi racial ladder than even the Jews? And this is to say nothing of how the Zionists, during the 1930’s, prioritised building the state over saving the Jewish refugees. This is not conjecture. Most reputable Zionist historians, even Ben-Gurion’s official biographer, Shabtia Teveth in 'The Burning Ground - 1886-1948' describe his attitude to the holocaust as being a beneficial opportunity. Zionism not only blocked attempts by Jews to escape to places other than Palestine but actually sat on the first definitive report of the holocaust for 3 months, from August to November 1942 (at the request of the US Administration) and then sought to minimise if not deny that the holocaust was actually happening. The details are in Shabtai Zvi’s Post-Ugandan Zionism on Trial The Arabs of today are also the Jews of yesterday. Teveth describes how Ben Gurion, Israel's first Prime Minister and Chairman of the Jew Agency 'concentrated all his efforts on the program, not to the tragedy of European Jewry. He maintained a puzzling silence about what was taking place in Europe and Riegner's telegrams.' [p.842] 'In spite of the certainty that genocide was being carried out, the JAE did not devite appreciably from its routine' [p.848] 'Regarding Jewish adversity as a source of strength had always been at the foundation of his thinking... "distress" could also serve as "political leverage".... "The harsher the affliction, the greater the strength of Zionism.' . Unsurprisingly Teveth entitles the chapter on BG and the Holocaust 'Disaster Means Strength'. The disaster of 6 million dead was a source of strength to Zionism. Little wonder that Teveth, Ben-Gurion's devoted discipline wrote that 'If there was a line in Ben-Gurion's mind between the beneficial disaster and an all-destroying catastrophe, it must have been a very fine one.' But again I digress. At a time when even a French Parliamentary Report accuses Israel of Water Apartheid in the West Bank and when Israel’s Ambassador at the UN, Ron Prosor, holds friendly meetings over dinner with French fascist leader Marie Le Pen , to say nothing of our own Jonathan Hoffman demonstrating alongside the English Defence League, a handful of misguided supporters of the Palestinians believe that their salvation lies in digging up the bones of European anti-Semitism. the far right of 1930s stood against what they considered 'Jewish onslaught', while you, Sir, join in it. Your joining forces with Zionism is a full betrayal of the English ideals whose best features were exemplified by Chesterton and Eliot. By your parroting of Jewish nonsense of "Islamic threat" you are supporting their drive on the Middle East though this step brings in the immigration you object to. 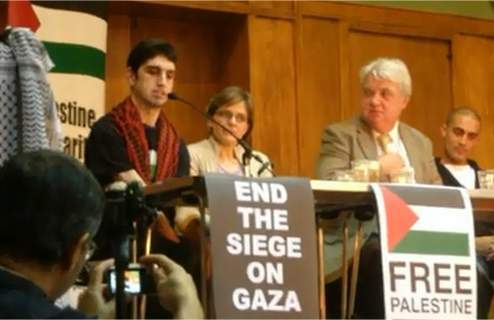 On Saturday PSC will hold its AGM at Conway Hall, London. 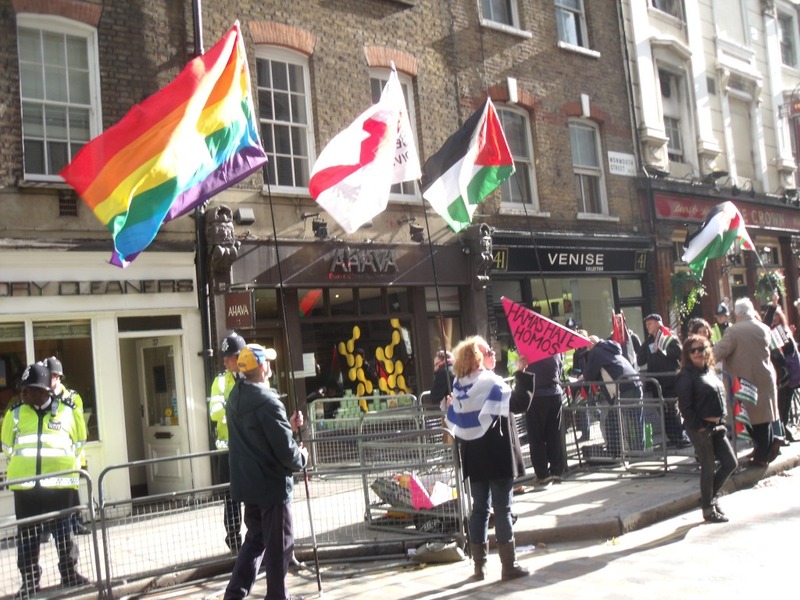 It takes place against the background of severe disruption to PSC’s work by a handful of supporters and sympathisers of Gilad Atzmon – the anti-Semitic ex-Israeli jazz player. ‘Re Mary Rizzo, and her fantasies, she was referring to Morris Herman, she quoted a Pls 'source,' at the time I went and asked the 'source' and the source admitted that she had no idea who Morris Herman..this put an end to my relationship with Rizzo..
No doubt Atzmon investigated his links with an alleged Mossadnik very carefully! You might also think it is a choice between syphilis and gonorrhoea, but despite her undoubted anti-Semitism, Mary Rizzo is at least sincere in her support of the Palestinians. But I digress again. To Atzmon, the holocaust was a ‘narrative’, a story whose ending could be changed at the flick of a pen. Of course Zionism has shamelessly used the holocaust as a political weapon to justify the expulsion, massacre and exploitation of the Palestinians. It is not surprising that a small minority of their supporters have responded by adopting holocaust denial, whilst not being pro-fascist or personally anti-Semitic in any way. Indeed Atzmon is quite unique among his followers in that he is genuinely anti-Semitic on a personal level. But if you are a sincere supporter of the Palestinians then Atzmon's holocaust denial acolytes must be cast out. ‘If, for instance, the Nazis wanted the Jews out of their Reich (Judenrein - free of Jews), or even dead, as the Zionist narrative insists, how come they marched hundreds of thousands of them back into the Reich at the end of the war? Zionism and its propagandists, in what Norman Finkelstein termed the ‘Misuse of anti-Semitism and the abuse of History’ [Verso, 2005] have taken holocaust denial out of the confines of a small coterie of European neo-Nazis and helped popularise it in the third world. The argument is that since Israel claims legitimacy through the holocaust all one needs to do is deny the holocaust to deny Israel any legitimacy. However the holocaust is a fact and this ‘logic’ ends up as an endorsement of Israel! It is precisely this phenomenon which has misled a small minority of PSC members and Palestinians. It is a product of an almost complete depoliticisation, coupled with a separatist reaction to oppression. Zionism was a separatist movement which adopted the framework of anti-Semitism. The anti-Semites said the Jews did not belong in non-Jewish society and the Zionists agreed. The same is true of radical feminism or Marcus Garvey’s meetings with the KKK. If Zionism had remained at the level of ideology it would have been an interesting historical curiosity. But Zionism sought and obtained an alliance with western colonialism. German, French and British imperialists fell over themselves to endorse a ‘return’ of the Jews to Palestine. The British won with the Balfour Declaration of 1917, named after its author, Arthur James Balfour, the anti-Semitic Foreign Secretary who introduced the Aliens Act 1905, designed to keep Jewish refugees from Czarist Russia out of Britain. A British colony in Palestine would be strategically useful, being adjacenet to the Suez Canal, on the route to India. Indeed it was non-Jewish imperialists like Lord Palmerston who were the first Zionists. And when coupled with the publication this year of Atzmon’s The Wandering Who? endorsed by at least 5 professors, including John Mearsheimer and Richard Falk, it is little wonder that a few of those inflamed by the persecution of the Palestinians should seek solace in holocaust denial. It would be futile to pretend that this has not caused major problems for PSC. But unlike the Zionist movement, we are able to expel and remove the racists. If the Zionists did so they would have no movement. Four years ago, some of us tried to ban the group, Deir Yassin Remembered, a group led by an open holocaust denier, Paul Eisen. Unfortunately the then Executive took a sectarian stance, denying that there was a problem. Today that is not possible. Up and down the country individual branches have experienced problems. In my own branch, Brighton, former National Chair of PSC, Frances Clarke-Lowes came out as a holocaust denier. He was promptly expelled by the local branch and then by national PSC. His appeal against this expulsion will be heard on Saturday. 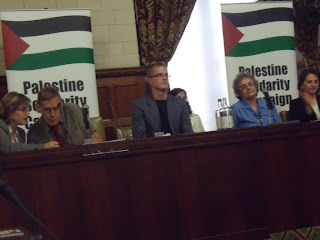 In Liverpool the Friends of Palestine website was taken over by a holocaust denier. In Exeter the branch had some involvement in the organisation of an Atzmon meeting at the university (although others protested strongly). In Bradford the Raise Your Banners group invited Atzmon to play at a left cultural festival and claimed PSC support, until PSC disowned it. In Camden PSC, the Secretary Gill Kaffash was forced to step down as Secretary after her holocaust denial sympathies became clear. Atzmon immediately attacked the statement. He didn’t know what holocaust denial means! These developments have been grist to the Zionist mill. The Jewish Chronicle and many other papers have run a number of articles, e.g. 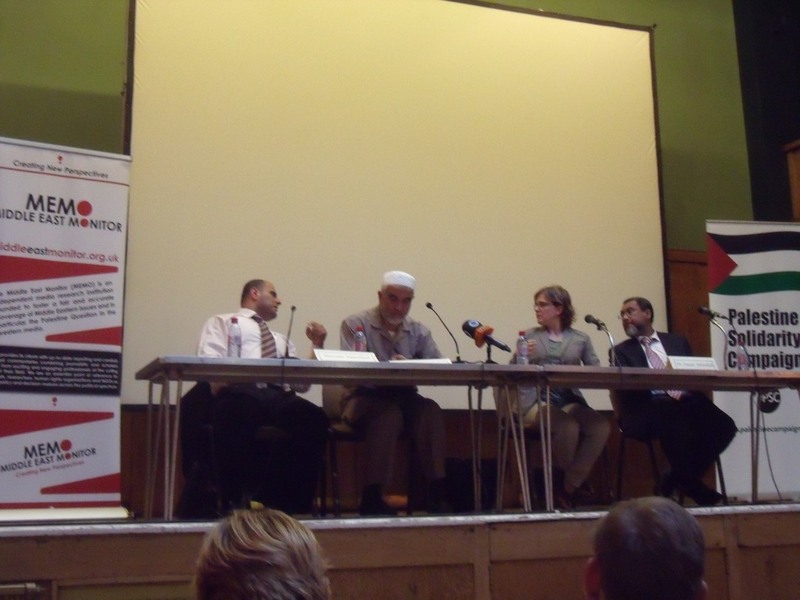 an attack on PSC by Atzmon’s supporters such as Lauren Booth, Tony Blair's sister-in-law. But the Zionists, trapped by their own racism, have been left struggling to find a response. Hence the JC has not only quoted my own blog frequently but in a remarkably fair article (for the JC!) Anthony Cooper wrote an article The Jews who can distinguish antisemitism from anti-Israel for which he was predictably savaged. Even the rabidly Islamaphobic pro-war site, Harry’s Place reprinted this article though not unnaturally taking delight at what it sees the infighting in PSC. But the majority of Zionist propagandists have tried to pass this off as mere infighting among supporters of the Palestinians. Indeed Atzmon has been praised by Harry’s Place for his anti-Boycott stance! On Saturday there will be one motion on anti-Semitism and racism on the agenda from the National Executive. A motion from Naomi Wimborne-Idrissi and myself, which called for more internal education on Zionism, has been amended and accepted by the Executive. At the AGM there is also a not very clever motion from Gill Kaffash and ex-Israeli Ruth Tenne, which seeks to define racism so as to exclude holocaust denial! They also manage to exclude Islamaphobia from their definition of racism by confining racism to its biological variant and its discriminatory effect. It is a stupid motion from the stupid. Support for the Palestinians is an anti-racist struggle. It can be no other. I urge all supporters of the Palestinians and members of PSC to come to the AGM and vote to ensure that the main motion is passed overwhelmingly and Kaffash/Tenne’s motion is soundly defeated. It might be helpful if you were to explain exactly what you mean by "Holocaust denial"? Since I know of no one claiming that none of it happened, what are you on about? Your have more holes than cheese in this story. First, froydianically, You name Shabtai Beit Tzvi, "Shabtai Tsvi" - the False Messiah, a person You probably admire very much. Then, You come out with all of this wishful thinking about PSC being non-racist. Well, it should be, and good luck in that, but there's low chance of that. Maybe in Britain it is held by a minority, but Palestinians at large seem to be antisemitic, holocaust deniers and racist to a large extent. Some people, apologetically point their victimhood as the source of these opinions, but it doesn't really matter, because such poison would remain much after the Palestinians will be freed and the outcome will be dangerous. Somehow You have fallen to the Fake postmodern notion that suffering more makes you side more just. since most Palestinians view Israel as their enemy, they fight it with whatever they can, including victim's-racism, holocaust denial, antisemitism. These materials are widespread in the middle east and they are granted much support by the different regimes in the area. Unlike what you suggest, that this is all reactionary towards Zionism, it is more like European old Antisemitism - Jews and Israel as a scapegoat to shape public opinion and guide it away from inner problems. It was plain at the beginning of the Arab spring that antisemitism was a "non-issue" in the beginning, and as more reactionary groups ascend to power, it is brought back to the headlines. It is common to charge Israel in the suffering of Palestinians, but the fact is much more of them are executed by commands of their own terror gangs than by the IDF. They are kept as refugees in the Arab world for more years than any other group around the planet and they are constantly used, some of them willingly, for other agendas than their own, primarily those of Arab regimes and Iran. There is no way that a bunch of people in Europe could convince masses of Palestinians to divorce from antisemitism. It must be their own choice, and it is not very likely right now. The funny thing is, You always ignore the crucial part of your country in the Palestinian suffering. The imperialists supported Zionism, but much less than they supported Arab dictators, who cared nothing for Palestinians, occupied their territory and prevented them from independence or even citizenship. those games of political incitement were the main reason of the conflict. in the formative years of the middle east today, Zionism was more on the side of progress, while imperial GB was the main reactionary force. Your raw and biased Marxism must focus on the the essence and not marginal issues. I'm not sure that pointing out my shorthand for Shabtai Beit Zvi is such a good thing especially when you accuse me of doing so 'froydianically'. I assume it is Freud that you're referring to! The cause of the Palestinians is an anti-racist one even if not all of their supporters understand this fact at times. Just as Zionism is irredeemably racist but I accept that there are some Zionists, like Ze'ev Sternhall who are not personally racist. Or indeed Uri Avneri. But they are a small minority. More importantly Erez says that 'Palestinians at large seem to be antisemitic, holocaust deniers and racist to a large extent.' I disagree. Ask most Palestinians if they hate Jews and they will make a sharp distinction between Jews as individuals and Israel. The tragedy is that they have been given cause to be anti-Semitic because people came to their land, in the name of 'the Jews' and expelled and massacred them and today even people turn a blind eye to the most basic and savage denial of their rights. I refer not just to the bible bashers of Hebron but to kibbutzniks who only allowed membership to Jews having first settled the confiscated land of those same people. Of course by way of seeking an explanation some Palestinians have been seduced by holocaust denial. This again is a consequence of the misuse of the holocaust by Israelis and Zionists. The fact that 'nazi' is a regular Israeli insult helps that process along. It also cheapens it to accuse any and everyone, even a business partner one falls out with, of being anti-Semitic. 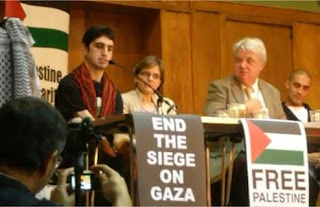 I seriously doubt if one Palestinian activist in Britain has not been called anti-Semitic yet I've met very little anti-Semitism from supporters of the Palestinians and even less from Palestinians themselves. What Erez cannot face is the fact that the palestinians fought Zionism and Israel, not because they were anti-semitic but because Jews came to Palestine as colonists. Not only Jabotinsky but Dayan, Ben Gurion et al. in their more candid moments articulated this. Holocaust denial is a neo-nazi European phenomenon, as is anti-Semitism. It was Zionism and European settlers who introduced it, as per the Damascus Affair of 1840. So I disagree with your assertions as there is no social basis for anti-Semitism in the Middle East. No one incidentally was more happy to see the defeat of the Arab Spring than the Zionists. Netanyahu made that absolutely clear and the Americans of course have been just as worried. My views are well known. I wish to see liberation throughout the region including Israel. The other stuff about the Palestinians suffering most from their fellow Ar abs, even if it were true is irrelvant. The cause of their plight is the Nakba and what has come after. Yes imperialism backed both Zionism and Arab reaction but it always placed more faith in the former and for good reasons. Israel was a stable base, the Arab regimes as this last year has shown are much more fragile. I should think that Kaffash will be confined to the margins. holocaust deniers come in many shapes and forms but in essence they deny that the Nazis had any plan or intention to commit genocide. It was all a consequence of war, which was much the Turkish 'explanation' for the massacre of the Armenians. They also deny the use of gas as a means of extermination but Irving was forced to concede in the libel action he brought against Penguin that poison gas was indeed used. He only denied its use at Auschwitz. The facts are clear and obvious and in fact it was German citizens who were first gassed. Possibly more than 100,000 Germans who were physically and mentally handicapped were murdered between 1939 and 1941. It was only when Bishop Galen of Munster spoke out that Hitler promised to s top the practice. It was a worthless promise, like most of those he gave. In fact the very same lorries used to murder German children (and they were mainly children) then trundled along the roads to Poland to do their work. In fact the second victims also weren't Jewish. Zyklon B was first tested out at Auschwitz on Soviet prisoners and gypsies. Only when they had perfected their techniques were the Jews subject to mass murder by gas. No one seriously disputes the above and that included Hoess who was hanged at Auschwitz and Eichmann, who had boasted before being captured, to a Dutch Nazi journalist Wilhelm Sassen, that his only regret was not to have killed more. Arguing with holocaust deniers is akin to arguing with those who believe the sun orbits the earth. And I would have exactly the same attitude to someone who denied the slave trade or the genocide of Africans in the Congo under Belgian control. Tony, your ability to make whitewash yourself is amazing. I also know quite a bunch of Palestinians who are not racist. I happen to work with them as an educator. This, however, does make any of us blind to the fact that holocaust denial is the most common position in their society. They consider it as a conspiracy aimed at them, and not the most horrid crime in the 20th century. this position is more common than general racism, or general hate towards Jews, but according to your own definitions that makes them racists. it matters none, that misuse of the holocaust by Jews (not just Zionists) has an big influence about that. As an educator about the holocaust, I deal with all kinds: mystification, counter-racism, denial, justification and others. Any victimhood by oppression encourages counter-oppression. Its not a paradigm, but a common consequence. Jewish diasporal culture is packed to the full of racist concepts, though they tend to be more abstract than others. Between the lines of many racist Jews and Palestinians you can easily read their (sometimes) just anger and victimhood that drives them. Zionism intended to be the cure of that: a free and equal people among other peoples, planted on its own land, working for itself without exploiting others, should have been the basis for removing racist ideas from Jewish culture. and some Jews, like in Hebron, suggest that sovereignty is instrumental towards hisotorical revenge. Most Zionists, however, would rather diminish hate and violence, support Palestinian independence with adequate terms. You are quite ignorant in Muslim history if You think there is no social base for antisemitism in the middle east. "Yes imperialism backed both Zionism and Arab reaction", yeah ? those "imperialists" were elected by British democratic votes. Even today GB is in charge of much more human suffering than any country in the middle east, directly by its place in wars, but more by its place in the Capitalist system, yet You feel it is more moral there than in Israel..... morals of whitewashing. there is no honest historical comparison that shows more imperial support for Jews than for Arabs, and plainly - that would quite Utopian to expect more support for a tiny fraction of Jewish newcomers (however justful) than millions of Arabs. However, that failed, and American and Soviet support for Zionists enabled us to establish a small (and painful) fulfillment of our wishes. "The other stuff about the Palestinians suffering most from their fellow Arabs, even if it were true is irrelvant. The cause of their plight is the Nakba and what has come after." but how can You clean GB, The Palestinian leadership, and the other Arab nations from responsibility over the NAKBA? It seems You are driven by hate and not by common sense. You are wrong about the Arab spring. most Israelis would rather see a democratic Arab world, that Israel can take a constructive part in. It failed because of the social structure, and the social effects of the recent decades of dictatorship, not the desires of Netanyahu. No Zionist is happy about the ascent of Muslim extremists. You call yourself a socialist but your analysis of racism, Zionism and of Palestine shows no understanding at all of very simple terms like superstructure. You seem to accept the fact that some opponents of Zionism are antisemitic but You fail to see how your writing aids them. "have more holes than cheese in this story"
I don't see any cheese, only holes. From all the mumble bumble, there is nothing in this article that makes any sense, there is no coherent or a direct message or explanation or any intelectual continuity, just a long collection of words. Looks like the auther things that if he gathers many words, it gets any meaning. I don't think Mr. Greenstein even understands himself. Cooper's article is bloody awful. His thesis that Jewish anti-Zionists may be daft, but since their primary motive in defending Palestinian rights is fighting anti-Semitism they're really OK - merely channels Atzmon. I'd rather the JC just went back to calling us "self-haters". You believe the near 1400 casualties inflicted by the IDF during Cast Lead were really the results of ‘executions by commands of their own terror gangs’? Do you believe that had a similar refugee crisis been caused in Europe, European ‘brethren countries’ would have absorbed these refugees w/o a peep? As always you’re applying double standards and look at the ‘Arab world’ as a faceless, monolithic bloc. And you know this, how? When the British were attacked by Nazi Germany the former hated the latter with a vengeance and later that hatred dissipated completely. Why would ‘Arabs’ be any different? Because they’re not like the ‘Good Jews’ (because that’s what your little spiel is all about, is it not? “Righteous Zionists” v. “Scumbag Untermenschen”? I suggest you look up 'CODOH holocaust': these guys effectively claim nothing happened! Congratulations Tony, you are Gilad Atzmon's sayan of the week. I thought "denying the holocaust" meant "denying the holocaust". Thanks for putting things straight. At the end of the day, Erez’ points are classic Zionist tropes, in which the victim is blamed for his own fate, not the oppressor, and the oppressor is absolved from wrongdoing on the basis of the victim’s hatred for the oppressor. Sorry, commenter with the Hebrew handle, but you make very little sense to me. Your allegation of TG whitewashing GB is so far off the mark, I’m taking you for a blind man or one with serious reading difficulties. Re. Holocaust denial in the Arab/Muslim world, TG has already wonderfully explained that, several times in fact. Look it up on this blog. Assume that you single-handedly beat all Holocaust denial out of the Palestinians: do you think that would make them more amenable to modern day Zionism and its indefatigable expansionism ??? It is essential for Israeli Jews, with a few exceptions, to do their best to identify with the victims of the Holocaust in order to justify their own role as oppressor. Occasionally it sinks through to some that the equation is the other way around, such as a doctor at Ansar 3, an open air prison for those in the Intifada, who was expected to report on those who had been subject to torture, beatings etc. so that the person wasn't killed. He said to the officer accompanying him 'Do you think I'm Dr Mengele?' But such examples of decency and reflection on the real meaning of Israeli oppression usually escapes Zionism's apologists. Though to be fair, many many more of the Israeli Right are in fact identifying with what the Nazis did, as the parallels are too strong. Gert: are You kind of a TG sideshow clown ? addressing me words I did not say, and then asking whether I believe it is not a proper way to argue. Islamists later who challenged its authority, in one day. Fatah in the WB is not that cruel since Arafat died, but they murder or sometimes execute people who sell land to Jews. the overall number of Palestinian civil casualties from internal violence, is bigger than those by Israel. The terror gangs were surprised by the first intifada, but they found their bloody way to lead it, and were the leaders on the second one, much more violent including suicide bombs. It is not a secret that extremists aid each other by keeping the bodycount active. AS for refugees, only Israel and Jordan gave some of them citizenship. others exploit them, Quait deported them after the gulf war, some of them they volunteer to terror groups that served the interests of Iran, Iraq, Saudi's and others, but not their own. Their affair with terror, drove Hussein to butcher thousands of Palestinians, the exact figures of casualties would never be known. If You maintain your superficial views of the world you'll get nowhere. BTW, GB did take vengeance from Germany. though not as cruel and hard as the Soviets took, but it had its share of horrors. to end the cycle of victimhood and revenge it takes more than puff heads who debate about the proper way to define antisemitism of holocaust denial. It takes different socio-economical background and other political platforms than the current ones You fit so well into. Just like Arab spring was starting to create a change, and now it is overrun by reactionary forces, Israel was starting to shift during the summer with J14, and now, Jewish terrorists, racists and religious zealots change the public atmosphere. A classic "divide and rule". Your own stupid remarks serve the bad guys. "Support for the Palestinians is an anti-racist struggle." No it isn't. It's a struggle for human decency and freedom. Trying to redefine it as a struggle against anti-semitism only helps the Jewish state. By the IDF’s own figures about half of the casualties were non-combatants. In all 10 times more Gazans lost their life than Israelis did. “125 Israeli children have been killed by Palestinians and 1,471 Palestinian children have been killed by Israelis since September 29, 2000. 1,092 Israelis and at least 6,537 Palestinians have been killed since September 29, 2000. Trying to explain (in general) the higher casualty numbers by Palestinian internecine killing alone, is like claiming Joan Peters’ ‘From Time Immemorial’ is a history book. And perhaps it’s not a secret that Israel does everything to underestimate the casualties it inflicts? Often denying any responsibility in the shrillest of tones? Your point about Arab treatment of Palestinian refugees, even if I accepted it at face value, is irrelevant but I’m glad it makes you feel better! The refugee problem was caused by Zionism and Zionism alone, try and remember that. J14 was never about anything other than socio-economical factors internal to Israel. Questions about the occupation were scrupulously kept out of the protests and debate. To believe that a progressive movement was emerging that would address Israel’s main problem [the Palestinian question] is very spurious. Most of Israel, including what’s left of the Left (they can’t even play cards together: no fourth man! ), seems deeply resigned, committed perhaps, to the status quo. That’s a recipe for an unintentional one state solution, of course… Spare me your polls about how ‘Israelis want peace’: everyone wants peace but few seem willing to pay the price for it. The victims a crime aren’t absolved from any wrong doing but you seem more than willing to attribute a very high share of blame to Zionism’s victims. I wonder why? In all 10 times more Gazans lost their life than Israelis did. In all a 100 times more Gazans lost their life than Israelis did. "To believe that a progressive movement was emerging that would address Israel’s main problem [the Palestinian question"
Jews has a right for a state in Eretz Israel, and while most of the world accepts that, the Majority of the Arab world fails to do so, in any borders. The Palestinian questions nothing but a local issue. it's a regional one. While other states do far worse crimes than Israel, You might demand a stop, compensation, but not disassembling of the state. Even Germany was restored. Denying that Israel's right to exist, while supporting other nation states, is a form of antisemitism. To blame the only Israel in the refugees problem, is historically wrong, and is based of robbing all other factors of their historical importance. The main problem, BTW, is not who started it, but who sustains it for so many years after it was caused, meaning, denying return, denying citizenship, denying representation, occupation by Jordan and Egypt, advocating for terror, denying compensation (which would involve compensating Jewish refugees from the Arab world, that numbered more than those deported in the Nakba), and like the Nakba itself, responsibility lies with all the factors, not Israel alone. Is it really so hard to understand why is it so difficult to give Palestinians "justice", in terms that endanger your very existence ? Even if Israel ceased to exist, Palestinians wouldn't not be freed so soon, They'd still have to deal with internal Violence, and Arab/Persian imperialism. http://palestine-vs-israel.blogspot.com/2006/07/un-report-palestinian-internal.html for an example, before the violent takeover of Gaza by Hamas. "J14 was never about anything other than socio-economical factors internal to Israel. Questions about the occupation were scrupulously kept out of the protests and debate." That's a stupid claim as saying there is no connection between internal politics and external politics. The main factor of why violence is sustained in the the region, racism scores, hate thrives, is the the capitalist foudation of all policies, of peace and of war, but for You this is just an "Internal isuue". As internal as the Arab spring. You seem to think that the economic structure of the occupation is a minor issue, second to the nationalist aspect of it, and hence it stands alone, independent of the nature of the regimes in the Area. Well, reality is more complicated than what can or prefer to grasp. For instance: the withdrawal from Gaza that turned, violently, and not by Israel, to extreme reactionary fort, that imports guns and missiles, not hospitals. Ask a UN worker what it's like to aid people under Hamas rule. "The victims a crime aren’t absolved from any wrong doing but you seem more than willing to attribute a very high share of blame to Zionism’s victims. I wonder why?" To balance the biased picture where only Jews can exploit the holocaust, get paid compensations, and justify their own crimes. as for the numbers of casualties, that is not a technical debate. would more Jewish casualties fix the equation ? the IDF soldiers heart civilian population, but they doesn't use suicide bombers, or fire missiles from populated areas. To a large extent, the number of casualties derives from the low value of Palestinians lives, by Palestinians combatants. depicting Palestinians as helpless as, let say, Jews under Nazi rule, just doesn't fit the facts. The low number of Jewish casualties reflects Israeli defense policy, not low aspirations of terror groups. but what need of enemies Palestinians have, with friends like You ? Sorry Anon, but you throw that many curveballs and straw men it would be a waste my time to try and fully rebut. Good luck with your thoroughly confused narrative. As all good Zionists do, you’re basically blaming the victim for the oppressor’s oppression. Perhaps one thing worth noting: I’m not opposed to the existence of Israel. But Eretz Israel??? You know what that term means?